John Wesley Powell - Wikipedia, entziklopedia askea. 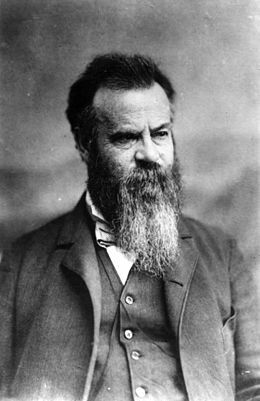 John Wesley Powell (Mount Morris, New York, 1834ko martxoaren 24a - Haven, Maine, 1902ko irailaren 23a) Estatu Batuetako geologo eta etnologoa izan zen. Colorado, Utah eta Arizonan ikerketak egin, eta Coloradoko Kanoi Handia aztertu zuen, bidaia arriskutsu batean. Exploration of the Colorado River of the West and Its Tributaries (1875, Mendebaleko Colorado ibaiaren eta haren adarren esplorazioa) liburua argitaratu zuen gero. Powellen lanek Estatu Batuetako Geologia Zerbitzua antolatzen lagundu zuten. Zerbitzu horren buru izan zen 1881-1894 urteetan. Orriaren azken aldaketa: 20 uztaila 2018, 18:10.